The most important to things to grasp as you decorate on a budget is patience and sweat equity. 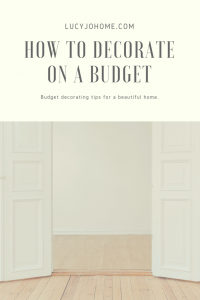 Set a budget for each project and save money each week or month for that project. Try to pay for your projects with cash. Again, this will take patience, but beauty has a price and sometimes the hardest thing to part with is your time! It is rarely worth accumulating debt to get a look you want right now when you can get the look with a little more time/patience. Not only will you have a beautiful room or home, you will have the peace of mind that you are not putting yourself into financial ruin to do it. One of the best advice I got when I was getting ready to buy a home was to start collecting ideas that inspired me. Pinterest is a great place for this. (Check out my Pinterest profile: Lucyjohome.) You can also tear pages out of magazines, copy and paste pictures, collect fabric swatches and take samples that are available through the home improvement stores you walk through. Just like a vision board helps you create the life you dream of, a mood board helps you to make your home decor/design ideas a reality. [A mood board is a collection of images and products that will inspire your decorating/designing.] Take note of the homes you love to visit and the places you travel to that bring you joy. If you can’t get a picture, write a note about the area and what you remember the most about it. When it is time to actually buy your materials or commission work, you will know exactly what you want and that feels good! DIY projects are your best friend. There are so many DIY ninjas out there. Follow their blogs; try the projects they feature and create pieces for your home that you love. Some of my favorite projects have been creating floating book shelves for my children’s books, reupholstering a kid table and chairs, creating a headboard and framed state silhouettes for my front room. A lot of the project ideas I used came from the book Young House Love, and the others came from Pinterest posts that I saved. Investing in your home through your sweat can help you feel like you are making progress. Warning: Don’t get caught up in doing a ton of little, low-cost projects if you need to save your money for larger projects. Do you need a wreath when your kitchen tile is falling off? Make priorities based on your needs and not just on your wants. Also, carefully evaluate the cost of creating something yourself and the buying it new. There have been some DIY projects we opted not to do because it was less expensive, and less time-consuming to buy the item. Be wise with your time, money and energy. Remember that less funds does not mean less beauty. I know it is hard not to have the homes that we see on Instagram, Facebook or Pinterest; at least it is hard for me sometimes. I get discouraged that I can’t buy the $800 rug that I love or buy all the furniture I want in one pop, but I know that as you learn more about interior design/decorating, you will be able to create beauty with less, and what you don’t have, you can create or save for with some work and patience. Best wishes in your efforts to create your heaven on Earth!